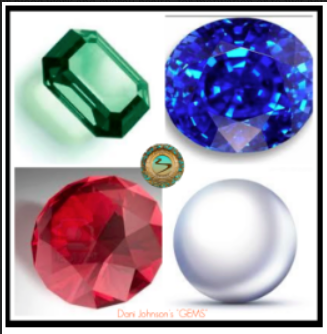 In the following sections you will learn how to apply GEMS™ to different areas of your life. Approaching people with their Primary GEM is very important. Your initial approach can sometimes set the entire stage for your conversation, your presentation, or your family discussion! When you engage them with their Primary GEM, you are treating people the way that THEY want to be treated, instead of how you would want to be treated. Let’s look at how each GEM likes to be approached. Do you think that if you approached people with their Primary GEM that you would have a better chance of them buying into your ideas? Absolutely, so let’s begin by showing you how each GEM likes to learn/hear about a new idea. Example: Sharing ideas could mean that you are doing the following activities – presenting to your spouse a possible vacation destination, showing your coach on a new way of doing business, showing a customer a new product you want them to buy, or even getting your girlfriend to go out to dinner. SAPPHIRE To share your ideas with Sapphires, keep it upbeat and simple. They love to meet face-to-face as well, especially for lunch or something that gets them out of the office. Make sure that you can highlight the following points while you are sharing your ideas. Always smile and F.O.R.M. first! Keep it simple, don’t get too technical Be upbeat and very friendly Keep everything very positive - if negatives come up handle with a smile and tell more stories There is no need for brochures, just show them the product Allow them to experience the product, feel it, and touch it Don’t tell them about all of the details, just paint the picture Show them how easy it is to get the results they want Tell lots of stories Keep the conversation light and casual, nothing too formal They will say YES in a lot of ways, when they do, let them buy your idea Really create the vision for them Tell them you can do all of the paperwork/details for them Bottom line “keep it simple” PEARL To share your ideas with a Pearl, if possible, do it face-to-face, or at least over the phone. This is considered a more personal approach and they really appreciate the personal touch. Make sure that you can highlight the following points while sharing your ideas. Always smile and F.O.R.M. first! Make the appointment on their “turf” if possible it makes them feel more comfortable Begin by letting them know that you are grateful for them taking the time to meet with you. Tell them up front that you will support them no matter what their decision is Tell them how it helps them or their family Share lots of stories with them Listen to them! Be sure to keep control of the conversation Don’t overload with details, let the testimonials do the work. EMERALD To share your ideas with Emeralds have all materials and information available to them. You don’t have to tell it to them, they will do all the research they want to, and your providing it up front will make it easier. They do not need a lot of personal contact, so phone, email, and websites are best. Make sure that you can highlight the following points while sharing your ideas. Always smile and F.O.R.M. first! Send them brochures, or to your website before your meeting if possible. If not, make sure to let them know you can give that to them at the beginning of the meeting. They want information and they will go searching for it. Show them the value in your idea/product Validate why it works, but don’t overstate it Make sure to hit their needs within the idea/product Talk about the integrity of how this idea makes sense If you don’t know the answer to something, don’t pretend you do. Simply say, “That’s a great question, and I would like to make sure I get you the most accurate answer. Would you be willing to let me get back to you?” RUBY To share your ideas with a Ruby, be sharp and concise. Tell them why they have to have it or do it, what the best features are, and how great it is going to be for them. Keep the process moving fast. Make sure that you can highlight the following points while sharing your ideas. Always smile and F.O.R.M. first! Why is it the best? How fast can they get results? How can they get it now? Tell short testimonials - ALL results-oriented testimonials Be results oriented Keep it concise Keep putting their goals in front of them Remember they love to be the first one in on something The Ruby has to be “Alpha” in every equation, so let them have a shot at leading They also love giving their opinions and ideas Validate their ideas and opinions and build a bridge to yours. Here is an example: “Jim that is a great idea - I like it particularly because of XYZ and I believe, based on the results our clients have had with this program ,your idea will fit perfectly with this program.”? Receive Appreciation Aside from honoring your GEMS™ it is also equally important to show each GEM appreciation. Just like every personality receives and processes information different, they also receive appreciation differently. Whoever it is you want to say ‘Thank You’ to, keep their GEM in mind! Here are some guidelines and examples on how you can appreciate each GEM. SAPPHIRE Sapphires don’t need you to go into detail – just smile and say thank you! Sapphires love surprises and gifts. It doesn’t have to be expensive. They love encouraging words. Appreciate what they appreciate. Compliment and draw attention to their creativity, boldness, fun.... Sapphires love public recognition, especially done in a very demonstrative way like high fives. They love spontaneous random cards filled with encouraging words. A small gesture such as taking them out for coffee to say ‘Thanks’ goes a long way with a Sapphire! They like to go out, and they love verbal recognition. PEARL Be sincere! A forced thank you may do more harm than good. Pearls love a handwritten card, something more than a generic thank you. The card should be natural look. Pearls are usually the ones showing the appreciation so even the smallest gesture means a lot to them! They appreciate the personal touch. Pearls love sentimental things. Go the extra mile with being sentimental. You wouldn’t send a Pearl a crude joke on a card. They love recognition just like everyone else but not a lot of public recognition. Maintain casual, friendly eye contact EMERALD Be specific about what you appreciate! Don’t get them an impractical gift to say ‘Thank You.’ They don’t like clutter or want to load their shelves with trinkets and dust collecting items. Something practical and useful is best for the Emerald. Notice the details. Bring attention to the detail, diligence, research and excellence they brought to the table on a project or in the home. A card is nice, but it needs to be direct. RUBY Rubies are extremely busy. Even an invite to go out to coffee can be intrusive because of their long task list with very little time to complete it. A thank you card very specifically wrapped around their strengths and accomplishments is well received. For bigger appreciative gestures think an extravagant dinner or an expensive bottle of wine. When it comes to gift giving, Rubies like nice, expensive gifts. Rubies enjoy public recognition, especially when it has to do with a job well done. They love to be encouraged yet seldom are. Due to their confident nature others shy away from giving encouragement because they don’t want to give them a ‘bigger head.’ They desperately need encouragement just like anybody else does. So lavish them in praise throughout the week. ASSIGNMENT: Make a list of your DOWN LINE COACHES. Next to their name, list their GEM and a way that you, as their sponsor can better approach them, show appreciation and present new information to that specific coach. Take a photo (or attach the list) and post in the comment section of the group. 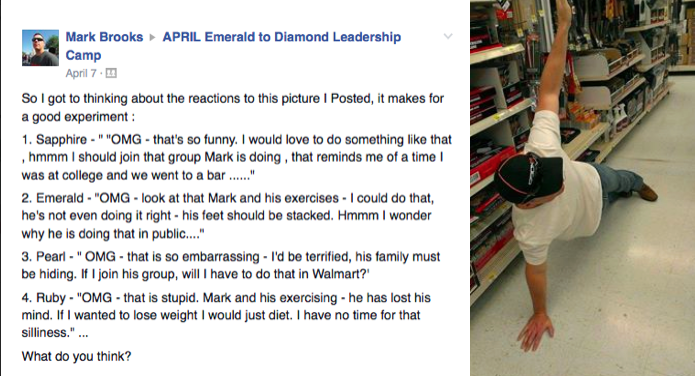 Great Job Mark!! !